UNICEF health worker uses a pen to mark the thumb of Ajeda Mallam, 6 months, who has just been vaccinated against polio at a camp for internally displaced persons outside Maiduguri northeast Nigeria. More than 41 million children are expected to get vaccinations against polio as part of a major new health campaign by the United Nations Children’s Fund (UNICEF) in the Lake Chad basin, aimed at the recent outbreak of polio in north-east Nigeria. At the regular bi-weekly press briefing in Geneva today, UNICEF spokesperson Christophe Boulierac expressed major concerns regarding the re-emergence of polio in Nigeria after two years of no recorded cases, stating that populations fleeing conflict have been on the move within the subregion, which raises concerns that the virus could spread across borders. As such, the agency has deployed 39,000 health workers across Nigeria and neighbouring Chad, Niger, Cameroon and the Central African Republic to deliver the oral polio vaccine in areas at high-risk for the virus. The spokesperson also stated that in addition to the 30 million children that have already been reached with vaccine during the first two rounds, the next round of the campaign is aimed at vaccinating 41 million children in the Lake Chad basin. In Borno state, a malnutrition screening was provided as part of the vaccination drive, he continued, also noting that UNICEF vaccination teams are conducting the screenings to identify cases of severe acute malnutrition in children under five before referring malnourished children to treatment programmes. “The immunization campaign is being delivered by national Governments, with support from UNICEF, the World Health Organization, Rotary International, the United States Centers for Disease Control and Prevention, and the Bill & Melinda Gates Foundation,” said Mr. Boulierac. Unfortunately, UNICEF’s response has been hampered by a lack of funding, and continued insecurity in the region. So far, only one third of the required sum for the emergency response has been received. “UNICEF and its partners have scaled up [the] response by using the campaign to also find out more about the occurrence of malnutrition and be able to treat it better, as new territories in northeast Nigeria had become newly accessible,” said Boulierac, referring to the regional effort, led by Nigeria to root out Boko Haram insurgents. He added that the first round of vaccination of this campaign began in August. 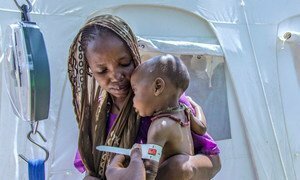 UNICEF reports 478,000 children under five with severe acute malnutrition in the Lake Chad basin area. In other north-eastern Nigeria states like Borno, Yobe and Adamawa, the number of children with severe malnutrition has reached 400,000.